We are proud to offer the peacefulness of the Inn at Laurita Winery for your retreats, reunions or other group functions. Located in the serene farmlands of Plumstead Township, you will find our peaceful atmosphere very inviting. Yoga and meditation classes can be held in our yoga barn, gazebo or, if weather allows, in the open air of our magnificent property. Our guestrooms add to your tranquility and are designed for comfort, spaciousness and light. Most of our rooms have fireplaces, air jet Jacuzzi tubs and balconies. You will enjoy our lounge area located on the second level. On our patio you will find a screened in gazebo and fire pit. There are always plenty of carrots to feed to our horses too! In between your retreat classes or functions, you can explore our quaint town of New Egypt and the surrounding areas, where you will find local farm markets, antiques, outlet shopping, horseback riding and golf. 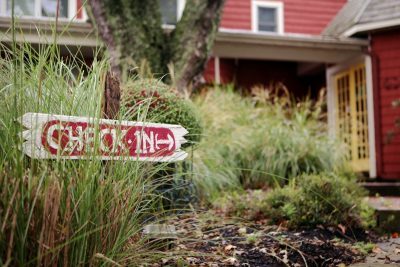 The Inn at Laurita Winery is ½ mile down the road from the Laurita Winery where you can indulge in its’ award winning wines and gorgeous vineyards. We would be happy to have you, so please call anytime for more information.